To most people, the “selfie” simply involves taking a photograph of oneself using a cell phone. To others, the term defines a pop culture trend dominating social media. But for Sam Louie, M.A. ’09, a psychotherapist and life coach specializing in multicultural issues and addictions, an innocuous snapshot can peel back years of repressed emotions and uncover the hidden truths behind words unspoken. More than 50 percent of clients at Louie’s Seattle-based practice are Asian Americans struggling with cultural shame surrounding behavioral dependencies like gambling and sexual addictions exacerbated, in part, by a crippling silence. Louie uses PhotoTherapy, a therapeutic technique where photography is usually self-initiated as a means toward personal growth, to help his clients break through this cultural barrier and begin to heal. A reality Louie understands well. The oldest of three boys, he grew up in Seattle, where his parents immigrated from Hong Kong when he was a child. “They were typical first-generation, blue-collar workers who spoke very little English and tried to acculturate the family into mainstream America despite the growing linguistic and cultural gulf between us,” said Louie of their complicated parent/child dynamic. “My younger siblings and I believed in autonomy and individualism, whereas our parents believed in collectivism and honoring the family name, which included following their wishes about our relationships and career choices.” For Louie, those limited options included doctor, engineer, or executive. When they disapproved of his desire to pursue journalism, he at­­­tempted to appease his parents by switching to teaching, only to waver again and finally follow his dream. During his tenure at KCET-TV in Los Angeles, Louie won two Emmy Awards in broadcast journalism—one for best newscast for a long-format documentary show and another for a poignant story on Los Angeles’ homeless. For Louie, the most satisfying aspect of his career transition has been validating the life experiences of his Asian American clients by reminding them that they are worthy of love. “So many of my clients have been emotionally deprived and had their experiences dismissed that they are shocked to have their lives and feelings affirmed,” said Louie, who writes a column, “Minority Report,” for Psychology Today, dedicated to race, culture, and psychology. Although content and happy, Louie envisions a bold plan for the future. “I want to create a nonprofit multicultural therapy center that focuses on cultural counseling and addictions,” he said. “On an artistic front, I would love to travel to the Asian countries where my clients have ties—Vietnam, Cambodia, Taiwan, China, Japan, and Korea—and create a photography book that helps therapists better understand each unique Asian ethnicity.” If a picture is, in fact, worth a thousand words, then perhaps this ambitious endeavor would help those who have felt stifled to finally find their voice. For more information about Sam Louie, visit samlouiemft.com or contact him at sam@samlouiemft.com. 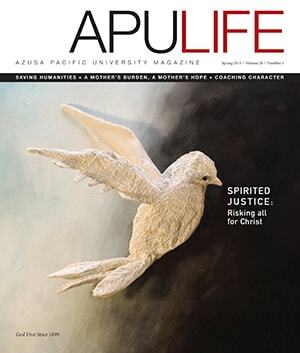 Originally published in the Spring '15 issue of APU Life. Download the PDF or view all issues.